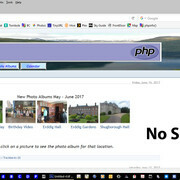 Using PHP 7.1 I have No Sidebar. 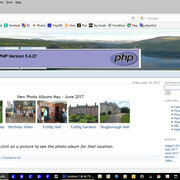 sjj1805 wrote: Using PHP 7.1 I have No Sidebar. I think there are still issues with PHP 7.1, s9y 2.1.x officially supports only PHP 7.0. That being said, you could try the same comparison with an up-to-date theme like 2k11 – that's usually the first test for theme-related issues, to try and reproduce the issue with the default theme. Thanks for the suggestions yellowled. Never thought of trying that but gave it a go inside a Virtual Box machine. I used the Web Platform Installer and installed PHP 7.0.2. Serendipity version is 2.1.1 . I also tried the suggested 2k11 theme. sjj1805 wrote: Unfortunately still no sidebar. That is incredibly odd because I can't think of anything that would affect the way your sidebars are displayed other than the theme, and I know for a fact that sidebars work with 2k11 and PHP 7.x. Your theme does not, by any chance, use custom sidebars (i.e. other than left, hidden, right)? Do you use any “exotic” plugins (sidebar or event) that might be related to the sidebars (sidebarhider comes to mind)? Do you have access to your web server's error logfile? Are all your plugins up to date? The Plug ins are all standard using the install a new sidebar plug in button in the ACP. Following your suggestion I moved them all to "Hidden"
I then individually moved each one back to the Right Hand column. It seems to be a problem with "Coppermine Thumbnails" - If I leave that one out then the rest are all displayed. Thanks again for your help with this. I will now play about with the Coppermine plug in settings and if necessary simply leave it out. I have been able to create the same effect by installing a HTML Nugget in the sidebar then simply putting a small table in that nugget containg the photographs and links to the gallery. sjj1805 wrote: It seems to be a problem with "Coppermine Thumbnails" - If I leave that one out then the rest are all displayed. I have zero experience with that plugin (or Coppermine, for that matter), but I know that at least some of these external media gallery applications are not maintained very well. Might very well be that the plugin is incredibly outdated and thus doesn't work with PHP7. Glad you could figure that out, though.